Kick off this semester with some food and fun! 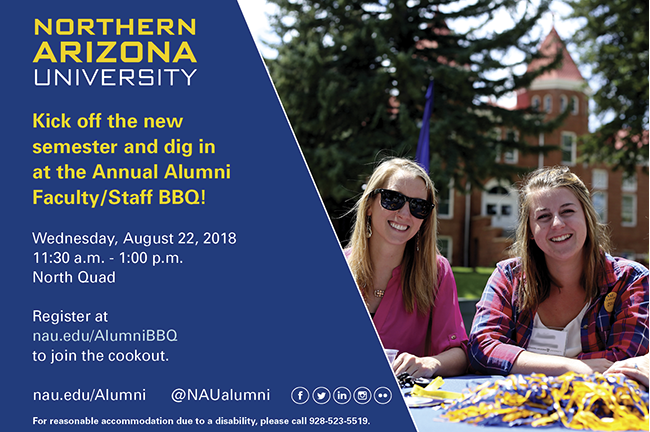 Northern Arizona University’s Office of Alumni Engagement will hold a barbecue for faculty and staff who are alumni of NAU. The complimentary cookout will be from 11:30 a.m. to 1 p.m. Wednesday, Aug. 22, on the North Quad. Attendees are encouraged to wear their name tag and bring business cards to be entered into the raffle. For those who plan to attend, please RSVP at nau.edu/AlumniBBQ. I couldn’t RSVP since the link seems to be broken. I would like to attend the event. Your request to attend has been forwarded to the Alumni office.